Spaceworks offers a vast array of glass services, from acting as a traditional glazier on jobs to working with designers to create custom specialty glass applications. Spaceworks offers a portfolio of specialty glass products from the most standard clear glass, gradients, and colors to the most extreme custom etching and printed interlayers. Our relationships with partners on the cutting edge of technology allow for creativity in providing innovative, customized solutions to meet specific customer needs. CLEAR TEMPERED: Standard in the majority of our framing systems, Spaceworks offers the ability to source clear tempered glass quickly to meet strict project deadlines. LAMINATED: Custom Colors, textures and materials laminated between layers of glass available in a variety of glass finishes and opacity choices. BACK-PAINTED: Fabricated with epoxy based coatings. Most durable and highest quality in the industry. DIGITALLY PRINTED GLASS: High resolution (up to 1500 dots per inch), large format (up to 96” x 150”) direct- to - glass digital printing of gradients, graphics and images. ETCHED GLASS: From intricately detailed etched designs on glass or mirror to deep carved patterns. PATTERNED MIRROR GLASS: Fabrication of mirrors with any pattern, color or gradient. 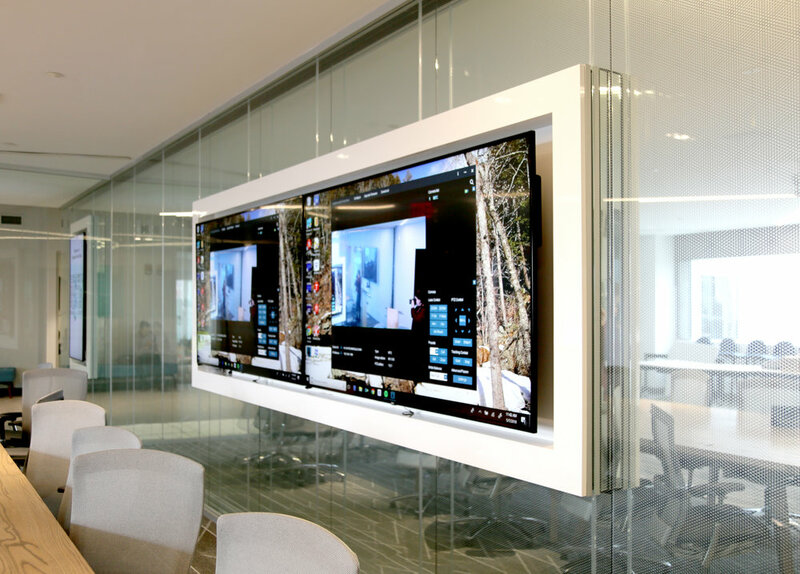 SMART GLASS: Switchable smart glass [or switch glass] that illuminates any environment creating multi-functional spaces that adapt and respond to users at the flick of a switch. GLASS FILM: Applied film in a variety of types and configurations, from standard dusted crystal and distraction banding to custom cutouts and designs.